Choose from over 20 designs. Most include a lockable, hinged clam shell. Ask about Windows, Android, and Kindle tablet options. These attractive and durable iPad Stands are designed specifically for trade shows, events, and retail environments. They are lightweight, secure, and easy-to-assemble. Most feature the innovative Swivel Stop™, allowing the iPad to rotate between the portrait and landscape position without tools. NEO is a line of portable, brand-able furniture specifically designed for the trade show and event industry. Unlike traditional furniture options, the NEO line is modular, lightweight, and designed to pack efficiently for storage and transport. 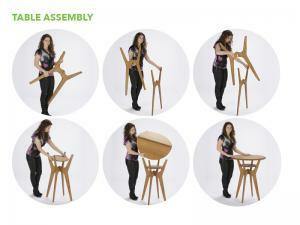 Its intuitive design allows it to be assembled in minutes without tools. Rental furniture is pricy and very often shows wear from transportation and use. Purchasing and shipping traditional home/office furniture components is inefficient. With no way to fold, stack, or nest together, they require large shipping containers to store and are prone to damage in transport. Never rent a table or chair again. The NEO OTMB-100 portable, brand-able table and chairs are the perfect alternative to expensive, impersonal rental furniture. 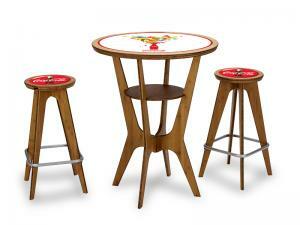 The attractive table and chairs assemble without tools, come in four finishes, and include a brand-able inlay option. Print your brand or message on 1/8" Sintra (or other material) and turn your meeting space into a sales opportunity. The tables and chairs pack in an optional roto-molded case with wheels and reusable foam jigging. Folding and stacking furniture, while efficient for transport and storage, lacks aesthetic appeal. In addition, most of these options are for a lower chair height. The best seating solutions allow someone seated to stay at the same eye-level as someone standing. Lastly, none of these allow a simple, cost-effective way to personalize, stylize, or brand like most other elements in the exhibit space. 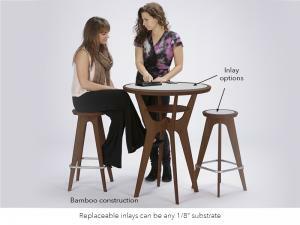 NEO is made in the USA and constructed with renewable bamboo and recycled aluminum. All glues, stains, and finishes are low VOC or VOC-free. The roto-molded shipping case and foam inserts are made from recycled resins. Whenever possible, inlays are printed on sustainable, certified green materials. Creeya is light weight tool free portable and modular system which are comprised of 2 basis aluminum profiles. An innovative locking and extension mechanism makes this system ideal for use in small inline exhibits spaces as well as large format displays. It is currently available in 10x10 and 10x20 incline configurations. The uniquely engineered profiles allow use of different graphic media such as fabric sintra and even wood panels. Apps: Smart exhibitors are using “smart apps” to extend the show. Digital tablets: Are you sitting on lots of content like PDFs or videos that help describe your company’s products and services? Digital tablets are the perfect medium to relay information to attendees. Mounting your iPad into a counter can prevent anyone from walking away or losing your tablet. E-literature: Are you trying to cut back or are flat-out tired of bringing tons of literature to the show? Create a digital resource center that clients can access after the show. Do you have a large LCD Monitor that you would like to bring to event? Have no fear the Standroid is here! Easy to transport and takes up to a 52 inch monitor and for for added impact can be used with many fabric displays. Takes minutes to set up. Wrinkle resistant dye sublimated graphic.